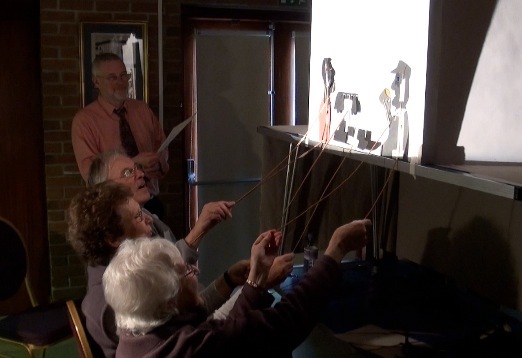 Shadowplay provided a platform for volunteers with the Royal Voluntary Service to share their experiences of working with older people in Pembrokeshire. During a creative workshop session facilitated by spacetocreate in January 2014, a group of 7 volunteers designed and made a set of shadow puppets and scripted two short stories about different aspects of their work. The process and performances were filmed and can be seen in the 6-minute film below. The first story explores the experience of Mrs P, whose post-stroke speech therapy was greatly aided by a visiting RVS volunteer and her dog. The second story documents a period in Billy’s life. Having lived alone and finding himself in hospital when his home was condemned by the local authorities, Billy was helped by the RVS to start a new life as well as retrieving memories from his former life.